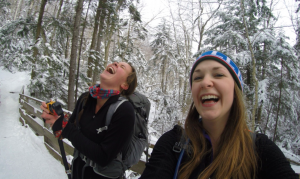 So, why the Appalachian Trail? Hannah and I participated in pre-orientation on the Appalachian Trail at our respective colleges (Connecticut College and Trinity, go NESCAC!). This also happened to be my first experience backpacking. According to the college freshman self-help book The Naked Roommate, pre-orientation programs are to be treated as mandatory commitments. As an incoming first year student at Trinity College, who happened to be incredibly anxious about the college transition, I decided to try something totally out of my comfort zone, QUEST; a four day backpacking trip on the Appalachian Trail. Now, you might be wondering what happened? Initially, I wasn’t sold on my first backpacking experience due to a variety of factors such as yummering watery beans and blistered toes and feet; however, I valued the lessons I learned about accountability, adaptability and responsibility while on the trail. Ultimately, I grew to love backpacking (thanks to learning how to pack a pack, toe liners and investing in quality gear) as well as the powerful transformative experience of the outdoors. Trinity’s QUEST program allowed me to transition from the role of a participant to an instructor with a Wilderness First Aid Certification. Now, as college graduates with graduate school on the horizon- Hannah and I decided to tackle the AT, the trail where our college experiences started on. With our start date rapidly approaching- we can’t wait to start hiking and see all the trail has to offer!